It’s times like these that the wise words of Adm. Adama come in to play: Sometimes you have to roll a hard six. Obama won’t be president by playing it safe. He’s got 70 days to go and things are close. Sen. Obama, good luck with the roll of the dice. Because of a hiccup last week, this post didn’t show up like I wanted, and it highlighted a bigger problem with all my blogs (the N Judah Chronicles, GregDewar.com, and so on) so this is posted later than I would like. But better late than never, right? Anyway, go right now to Battlestar Online and enter the contest. The drawing is September 1st so go now, and maybe you’ll win! Apologies to BSG Online for this going up so late! Some More Good News: Eddie James Olmos Has An Adama for President Shirt! Update: The always awesome Proggrrl of Galactica Sitrep gave us a link that better shows Eddie talking about the Adama For President site! Check out the new link to the video below! My shirt got a great response from fans; people were coming up to me and asking me where I got the shirt because Olmos mentioned it in his Q&A so I pointed them to your site. So here is the photo of me wearing the shirt with a Rorschach. This just made my day. Buy something now while they’re still up online – we don’t know when Zazzle cylons might take down more of our stuff despite the fact that the fair use laws are on our side! I just got an email from Josh Grant, one of our Colonial Patriot supporters, who sent in a picture he took at the summits of Mt. Brewer and Mt. Mitchell in the Sierra Nevada Mountains….wearing one of our Adama for President T Shirts! How rad is that? Josh went on a pretty extensive hike in the mountains and alerted friends to his support for Adama prior to the hike. I have to agree this is probably the highest an Adama shirt has been to date. Send in your pictures and we’ll post ’em here! Or post them to Flickr and be sure to send us the URL! Buy Now While You Still Can – Zazzle’s Taken Down One Shirt, Rest Are Still Up For Now! As of today, we are no longer able to sell our white Adama for President T shirts. Apparently Zazzle has chosen to interpret copyright and other law so narrowly, they have decided to take down our white Adama shirt, even though we do not really violate any laws. It’s a satirical piece, if anything we’re mimicking the Obama Campaign’s logo more than anything else, and Zazzle had no problem with this issue before. But now they’re screwing us over – again. If you were thinking of buying something, anything, go now and buy it before they figure out the rest of the stuff is still up there today! It’s really annoying though, to see so many fan shirts at Zazzle that mention “Adama”, “Roslin”, “Cylons” and the like and THEY don’t get taken down, but Zazzle’s CSR droids felt the need to screw us over for making a fan shirt. It’s as if we’re being singled out for being popular. Here’s the text of their form letter. If you don’t like what they’re doing, why not send them a note and tell them why this is a terrible, and misguided, decision? Thank you for your interest in Zazzle.com, and thank you for publishing products on Zazzle. Unfortunately, it appears that your product, “New Adama ’08 Tshirt Design – June 2008”, is in violation of Zazzle’s Copyright policies. Specifically, your product has violated in the intellectual property rights of Universal. We will be removing this product from the Zazzle galleries shortly. Some Friday fun for all of you Colonial patriots out there….remember if you buy a shirt or sticker or download our poster art, take a picture and send it in! or post it on Flickr! Welcome, Colonial Patriots from Comic – Con! Many of you may be arriving at this site due to our guerilla marketing (such as it was) at the San Diego Comic Con this past weekend. Maybe you got a great “Adama ’08” sticker, or better yet, one of our open-source “Viva Adama” posters! First, if you got a poster, or downloaded our free poster artwork and printed it out, please take a photo of where you posted it, either on Flickr (with the tag “adamaposter08”) or email it to us here at the campaign. We’d like to show the Admiral he has support all over Earth As Is, like, stat. Second, we’d invite you to buy one of our awesome shirts, stickers, and bumper stickers from our store on Zazzle. We’re not marking this up by much and really just want to have some fun before this election season is over. So go on over and find something you like. Ladies, there’s women’s fashions there too! Third, if you’re on Facebook, please join us at our Facebook Group with your pictures, ideas and fun! Thanks again for visiting and thanks for your support. Without it, I would never have made it to Comic Con, and with your support we’ll make it through the Hiatus from Hell soon. Also, be sure to check out our check out our BSG related pics from the Con! We’re At Comic Con! We’ve Got Stickers! Woo Hoo! and on Flickr – check out this Flickr badge to go to my set on Flickr! This is a Flickr badge showing items in a set called San Diego Comic Con Pictures 2008. Make your own badge here. One Week Until the San Diego Comic-Con! Well it’s only one week until the San Diego Comic-Con, where I’ll be attending not just as an “Adama ’08” supporter, but I’ll also be helping cover the Con for our good friends at Galactica Sitrep as well, with a focus on covering the BSG panel discussion and of course any random encounters with our heroes. 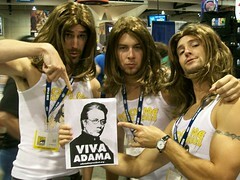 If you’re going, why not buy a shirt or a sticker to wear at the Con, and be part of the Adama bandwagon?